The 23rd (!!!) 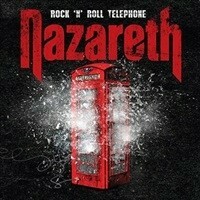 studio album from Scottish rockers NAZARETH will sadly be the last for long time vocalist Dan McCafferty. To those not in the know, health issues have forced the man to step away from the microphone, unable to sustain the rigors of touring and longer sets on stages both near and far. He was able to help the band find his replacement in Linton Osborne, but in the meantime we get to hear his bluesy crooner and whiskey soaked delivery one more time on “Rock ‘N Roll Telephone”. My time with the group goes back to my youth – first discovering their sound in a cut out vinyl bin through their 1981 “’Snaz” double live album when I was a teenager, and then seeking out a lot of their classic albums of the 1970’s at record stores and flea markets. They haven’t produced as many studio albums in the last couple of decades – but even so 1998’s “Boogaloo” and 2011’s “Big Dogz” prove they still can crank out some decent, bluesy rock and sometimes crank back into their older hard rock ways. The 11 songs on the main edition range from a slightly mid-tempo swinging opener “Boom Bang Bang” where Dan uses a slightly talk/ sing variation during the verses and choruses, while guitarist Jimmy Murrison throws down a few JANE’S ADDICTION/ RED HOT CHILI PEPPERS –like licks during the transitions, an acoustic oriented good time “Back 2b4” to “Punch a Hole in the Sky” that brings me back to the classic “Razamanaz” early 70’s days of the group. NAZARETH have always had a knack for keeping things simpler, stripped down, and groovy for more of an instantaneous swing/ hook appeal. Not everything hits the heart the right way (“Long Long Time” has too much of a beach feel for my tastes) but there’s enough dynamic versatility that even as they age they still offer creative ideas that I think will go over tremendously for their diehards. If you choose to get the special edition, prepare for 2 exclusive studio tracks (the darker, doomy “Just a Ride” and up tempo rocker “Feel Good”) as well as 5 live songs that include the always impressive “Expect No Mercy” and “Big Boy”- although the sound quality is a little distant and not exactly soundboard worthy. Overall I’m glad that Dan got the chance to release a final studio album and that NAZARETH will move forward – as “Rock ‘N Roll Telephone” speaks to the heart of classic rock/ hard rock fans – just in a mature, bluesy framework these days.